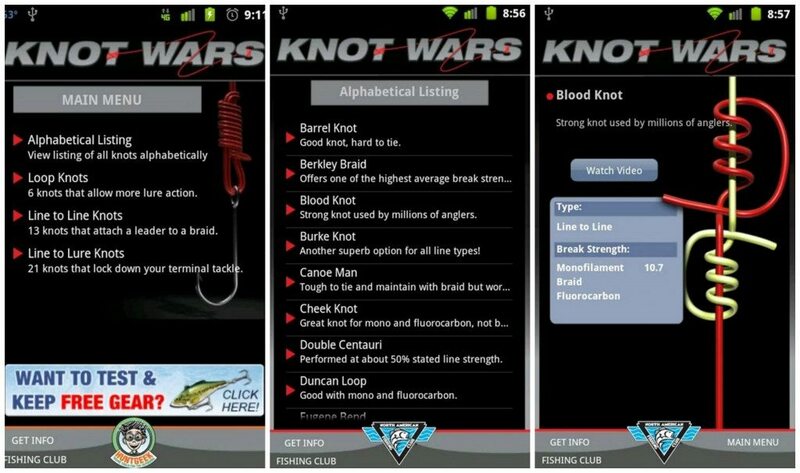 Before you start to fish, you have to first be able to tie a good knot – so we offer up a few knot tying Apps. You could just tie a plain knot, but there is a real art to tying a proper knot and these apps will walk you through step-by-step. One App even shows them in 3D and may make it easier for you to follow the lesson. We also included a few fishing games to let off some pent-up energy, especially if you haven’t caught any fish for the day – you can either play while you are waiting for a bite or in the tent before a good night’s sleep. At least one of the games is educational in how to fish properly – it offers fun and learning at the same time and I will apologize about the name, iFishing, right now…it was one of the most popular iPhone Apps and was ported over for Android. 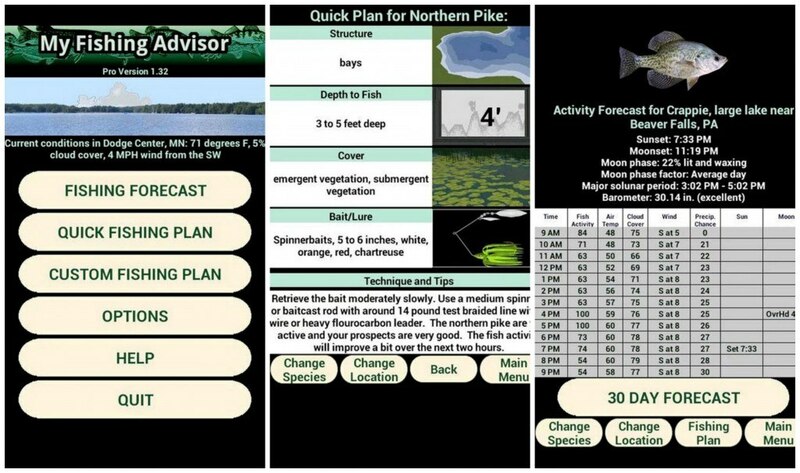 Some of the Apps help keep track of when the fish are most likely to be biting, provided the body of water is in its database, and a couple get more serious using GPS to track down the best spot to cast your line. Some Apps are free, others are free but offer an upgrade for more features and more areas to fish added, and some will outright cost you a couple of bucks…none of the options are very expensive. 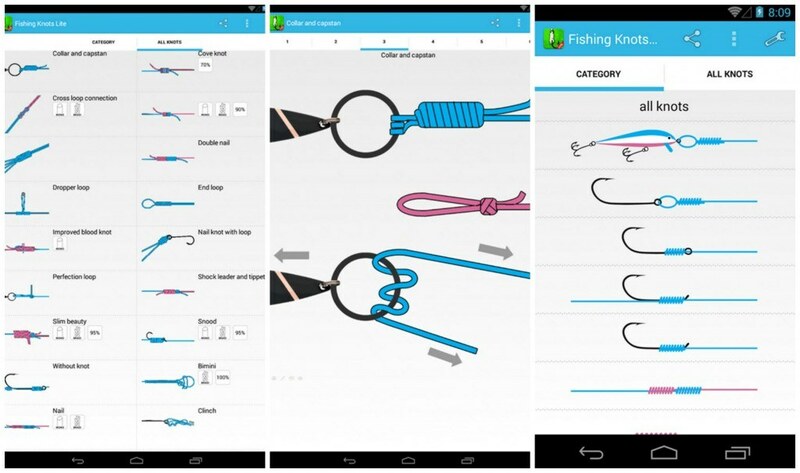 Fishing Knots Lite – is a program to teach you how to properly tie a knot in your fishing line. Each tying method is described in detail with illustrations. No internet connection is needed as all nodes are loaded during installation of the App. The interface is easy to use and drawings are very well done and detailed. The App is updated and refined on a regular basis. There is also a $2.00, Pro version that does not list what is different – possibly only the ads are removed. Knot Wars – is based on the popular segment from the North American Fisherman TV show. 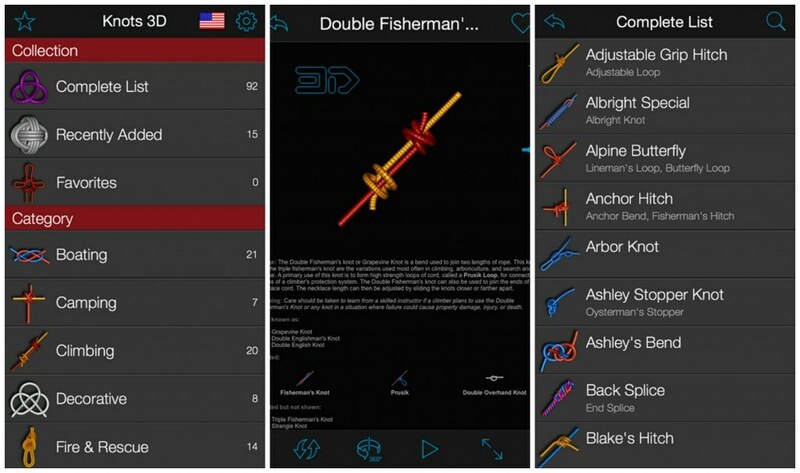 This App assembles all three seasons of competition and brings forward the forty strongest fishing knots altogether on your smartphone. It is a large program that requires you to have about 40MB available on your phone’s internal memory – once downloaded, the App will install on your SD card (Android 2.2+) and leave a very small imprint on your phone’s internal memory. Knots 3D – will set you back $.99, but is the number one Knot Reference in 75 countries according to Google Play. Learn how to tie, untie, and rotate more than 90 knots with no special tools other than you fingers. These knots may not all be for fishing line, but every boater needs to know how to properly tie up their boat or cruiser. The App supports both portrait and landscape and you can watch the knots ‘tie themselves’ on screen and even adjust the speed so you can get a great view of exactly how to tie the knot yourself. It is installable on your SD card and is 100-percent self-contained – no internet needed and completely Ad Free. 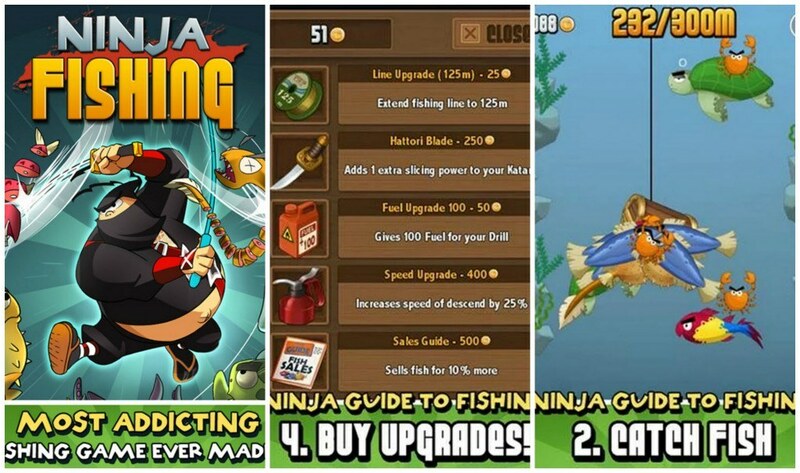 Ninja Fishing – the number one fishing game is now available on Android – there are already over 15 million users out there playing for free. This App was featured as a Google Staff Pick and is highly addictive with both tilt and touch controls. There are over 110 fish species to collect and earn gold to buy upgrades to help your efforts. They are constantly adding new islands. The graphics are sharp HD quality. Fish Adventure – this is more a pet caring game where you take care of nature and raise beautiful fishes, creatures, and actually develop an undersea world. Although fun, it is also educational and teaches us how to respect and care for the earth and its sea creatures. 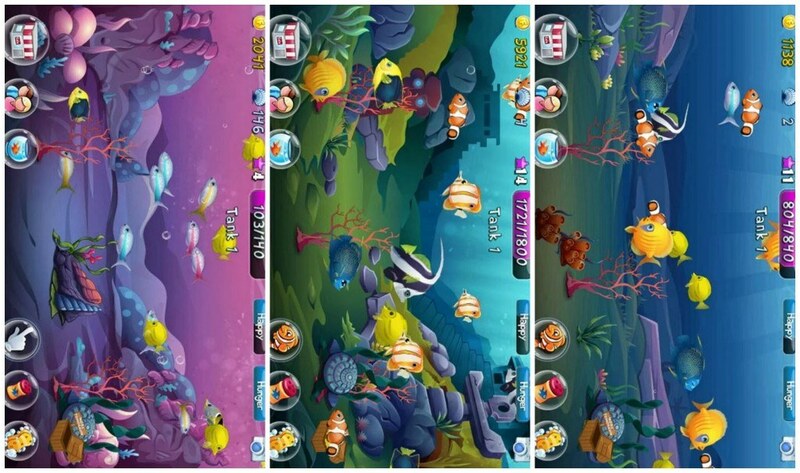 There are constantly new fishes and creatures and you can use your underwater sea world as live wallpaper. GRAB IT ON GOOGLE PLAY! 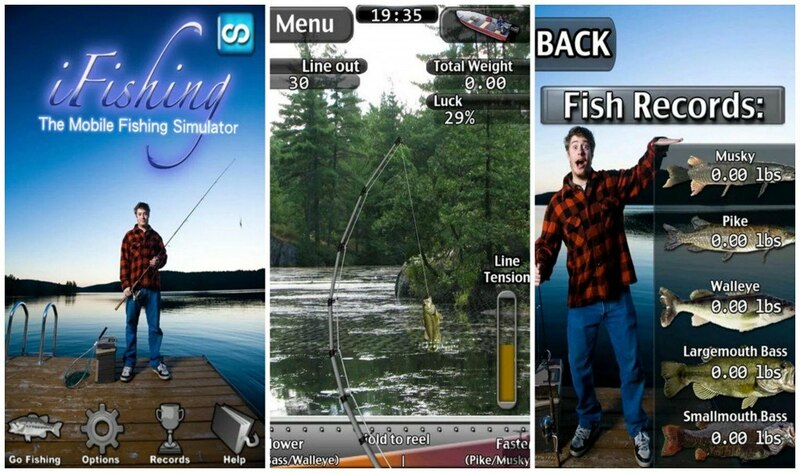 iFishing – Please excuse the name of this former iOS only game – but with over 20 million downloads it was the most popular iPhone fishing game and it is now available for Android. This company also has some more specific games that you may want to try – iFishing Saltwater and iFishing Fly Fishing. This is definitely the most realistic and in-depth fishing game in the Play Store. Rather than an arcade-like game, this is a true fishing simulator with HD graphics. It contains 15 unlockable lakes with 3 difficulty levels within each lake, assuring the action will keep you busy. It will cost you $2.71, but you will have hours of fun. 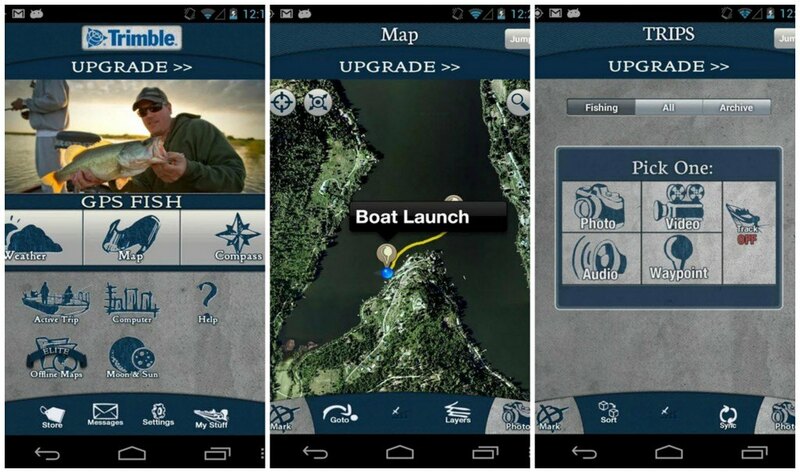 My Fishing Advisor – is not a game, but a freshwater fishing guide for your smartphone. It analyzes the weather, sun and moon position, moon phase and many other factors that expert anglers understand are important for successful fishing. Select your location via GPS or on the map, next select the type of body of water, water conditions, and what species you want to catch. The App will show you the best days and times for you to be successful. This Pro version for $4.99 is ad-free. Fishing & Hunting Solunar Time – is based on Solunar Tables theory to help you determine, as closely as possible, the best feeding times for all type of fish and wildlife. Use this App to help you plan your trip in order to maximize your chances of success. You can use either the GPS or manual entry to determine the location, save the best locations so that you can return to them. The App will give you both the times of the sun and moon rising and setting, current and five-day weather forecasts. This is the free version but you can make an in-app Pro version purchase if you would like. Fishing My-Cast – is an App from Garmin that turns your smartphone or mobile device into a real “fisherman’s friend.” With this $5.99 App you can plan your trip, watch weather conditions, and record where the ‘big ones’ are biting with a section where you log in your catches keyed to photos that you can share. Radar imagery is also available along with fish activity to help you target the best times and places to go fishing. 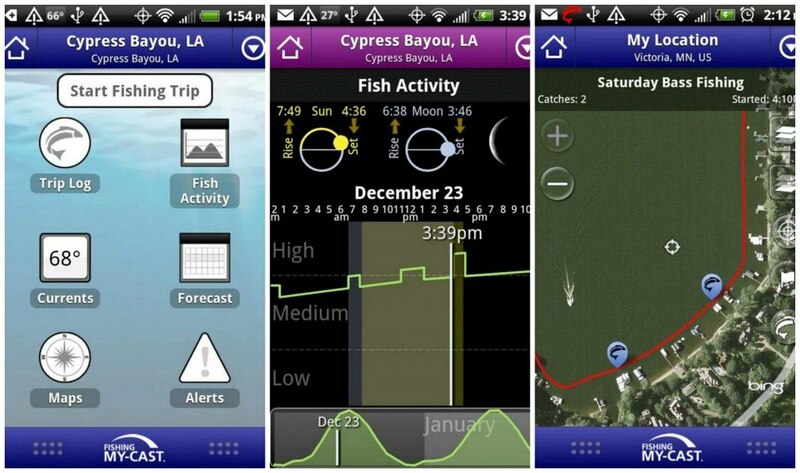 Trimble GPS Fish Free – is an awesome looking App that takes care of about every aspect of your fishing activity. The Pro version for $4.99 will allow you to save offline map bundles on your phone for viewing maps off-the-grid. Use GPS to mark locations of docks, fishing hotspots, boat drifts, trolling paths, and more. Share your fish photos with friends, view top, aerial, and street maps. 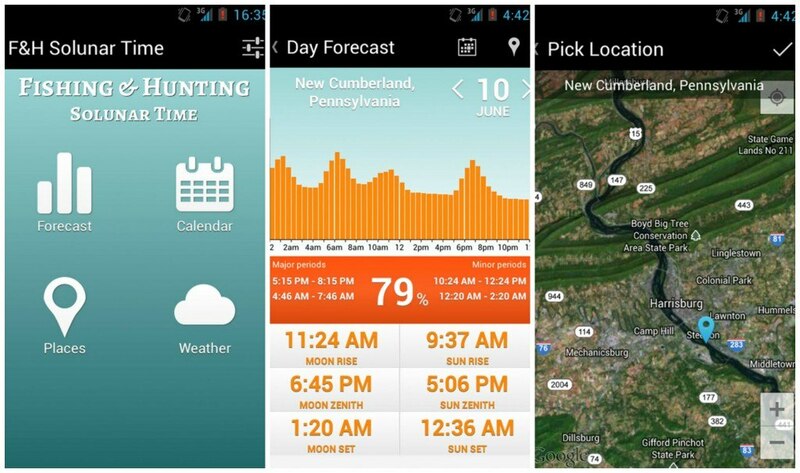 The App will track weather, sun and moon phases, mileage, compass directions and other important stats.